Venomous snakebites affect 2.5 million people, and annually cause more than 100,000 deaths and leave 400,000 individuals with permanent physical and psychological trauma each year. Researchers reporting in PLOS Neglected Tropical Diseases have now described a new approach to treating snake bites, using nanoparticles to bind to venom toxins and prevent the spread of venom through the body. The standard treatment for snakebites is the intravenous administration of IgG immune molecules that recognize venoms. However, such antivenom therapies must be administered quickly – and by trained healthcare workers – to be effective and are highly specific to particular venoms. There is an ongoing need for a snakebite treatment which can be used in a rural setting and works against the bites of diverse venomous snakes. 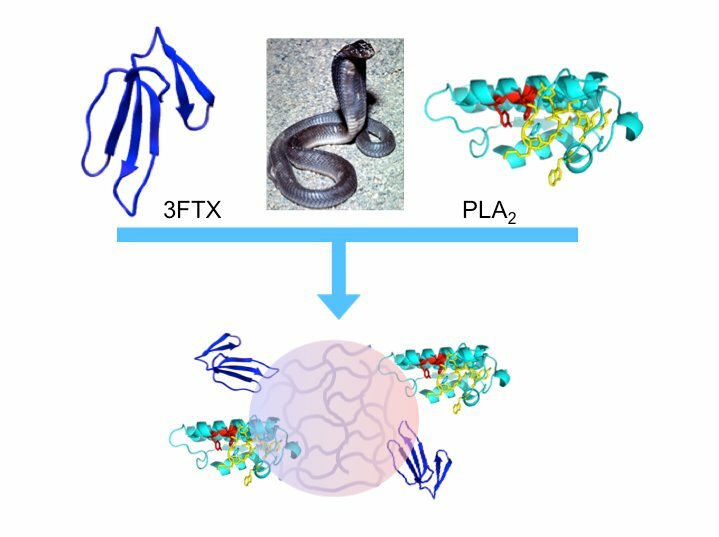 In the new work, Kenneth Shea, of the University of California, Irvine, and colleagues engineered nanoparticles that bind to and sequester an array of phospholipases A2 (PLA2)and three-finger toxin (3FTX) molecules found in Elapidae snake venoms. The Elapidae family is a large family of venomous snakes that includes cobras, kraits, tiger snakes, sea snakes, coral snakes and mambas, among other species. The researchers tested the ability of the nanoparticles to block Naja nigricollis (black-necked spitting cobra) venom in mice that received varying doses of the nanoparticles, injected into the skin. Envenomings by this snake in sub-Saharan Africa inflict serious cutaneous necrosis that may leave permanent tissue damage in the victims.